Our brief summer visits to the Stewart House in Nova Scotia are usually so busy with projects and socializing that we don’t indulge in any travel other than day trips. We might take a jaunt over to the South Shore to do a bit of kayaking or drive to Antigonish to see friends. Thanks to my wife’s sabbatical, we have more time here this summer than we have had since our move to Australia. When a good friend suggested we join her and her partner for a vacation in Newfoundland, we couldn’t resist. She even offered to plan the trip and make the reservations. 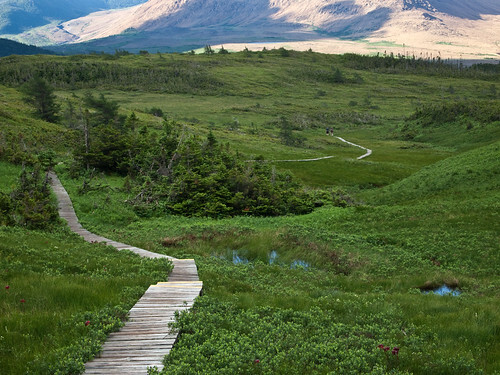 Our destination was the west coast, home to Gros Morne National Park and the Viking settlement site of L’Anse Aux Meadows. We would drive up to North Sydney, stay overnight, then line up in the morning for the six hour ferry to Port Aux Basques. Then, we would drive to the village of Woody Point and hopefully rendezvous with Darlene and Fred at a B&B called the Blanchard House. Newfoundland has a long and often unhappy history, beginning with the extermination of the native Beothuk Indians by European fisherman. For most of its recorded past, its plentiful cod stocks have been an irresistible magnet for fishermen, notably the French and the Basques from Spain. Few fisherman settled on the island, but it was a pawn in the never ending wars between the French and English. Although England claimed the rock as early as 1583, Newfoundland’s political fate was not really decided until 1949, when Newfoundland and a huge block of land called Labrador were finally ceded to Canada. Despite the rich resources of fish and hydroelectricity, Newfoundland’s lack of political clout resulted in cheap fish and electricity for the rest of North America and poor prices for Newfoundlanders. The invasion of deep-water fishing factories from other countries from the fifties into the seventies triggered a near collapse of the fisheries, but it was the Canadian government’s mismanagement that finally led to the drastic moratorium on cod fishing in 1992. That edict threw forty thousand Newfoundlanders out of work. To add insult to injury, the government began shutting down outpost communities in order to consolidate services. The recent discovery of offshore oil has salvaged the economy somewhat, but the Rock remains Canada’s largest exporter of willing workers in search of jobs. Woody Point is a small fishing village on a huge fjord called Bonne Bay located at the southern end of Gros Morne National Park. 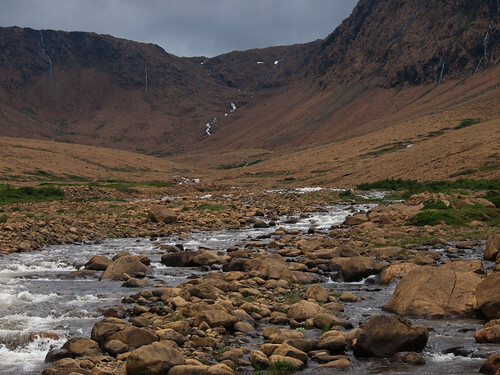 It is close to a fascinating geological anomaly called “The Tablelands.” If you have an interest in plate tectonics, Gros Morne is the place to be. 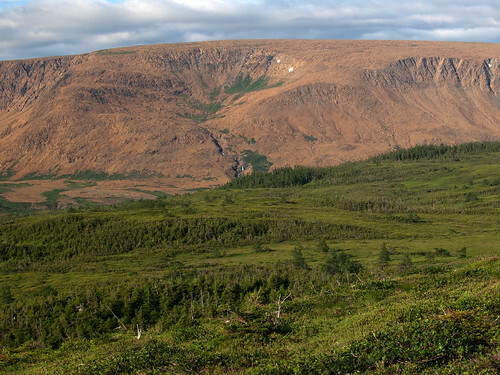 The tablelands are part of the earth’s mantle, a layer of iron-rich rock that is usually buried below a continental or oceanic crust. It is made up of Peridotite, composed of iron and other heavy metals inimical to plant life. 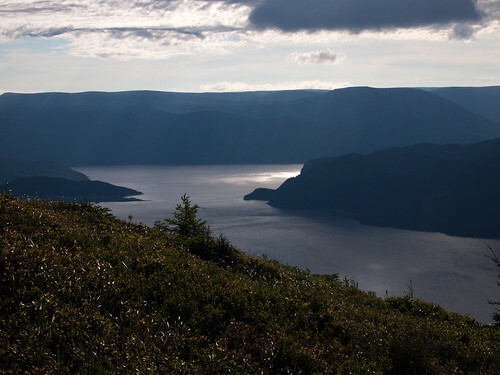 Within the the 1800 square kilometers (700 square miles) of Gros Morne Park, you will find coastal lowlands, long, narrow, deep landlocked fjords called ponds, peat bogs, forests of fir and spruce, cobble beaches and the vast alpine plateau of the Long Range Mountains, the northern end of the Appalachian range. During our week of adventure, we hiked and kayaked, shared breakfasts and bathrooms, sat down with fellow travelers to a wonderful dinner of cod thermidor at “The Tickle inn,” a century home in a spectacular spot called Cape Onion. We talked with the wife of a Viking chieftain, made fish chowder in a cottage that once belonged to Annie Proulx, author of “The Shipping News.” Fred braved the frigid waters of the north Atlantic for an early evening swim. We enjoyed a farcical play and some fine music in a village with the unlikely name of Cow Head. We encountered many motorcyclists braving cold rain, uncrowned roads and the serious possibility of colliding with moose. Australian readers will be happy to know that they are not the only people dealing with the consequences of ill-conceived animal introductions. Two pair of moose introduced at the turn of the century have resulted in an environmental nightmare. Today, over 150,000 of the ungulates are munching their way across the island, making moose encounter a leading cause of automotive accidents. Considering the intake of alcohol on the Rock, that is saying something. We learned some geology and discovered that there is a long and interesting history of various native peoples in Newfoundland long before the Beothuck. They left behind a large number of sites and artifacts that are still being excavated. We visited the museum of the extraordinary British medical missionary, Wilfred Grenfell. We ate fresh cod and drank Black Horse beer. Through no fault of our own, we missed the boat ride on Western Brook Pond. We will return. Next time, we might bring kayaks. if the boat won’t take us on Western Brook pond, we may do it ourselves. Check back periodically to see more pics of this spectacular part of Canada. I took four hundred, so it may take awhile.